More than 300.000 preschools worldwide have been trusting Poly M for over 35 years. 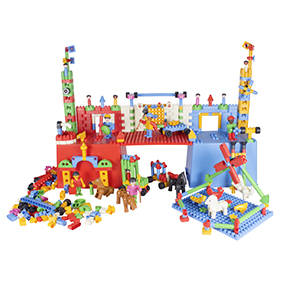 With 58 pieces, POLY M TWINI provides countless playing ideas and guarantees huge fun as they are easy to assemble and disassemble again. Children learn to distinguish different colors and shapes in a playful way. The versatile Multibox can be integrated into play. With Mega Construction Plate as lid. EXTRA: Funny eye stickers and Creativity card TWINI. 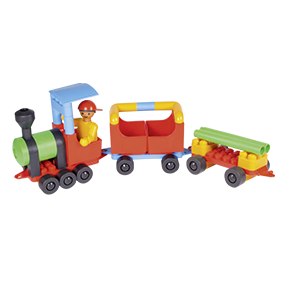 Even the youngest ones become great builders with the large and easy to handle building bricks. 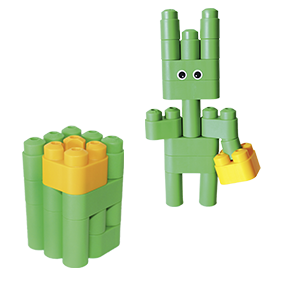 Imaginative animals and designs can be created from even only few building bricks, promoting an important sense of achievement and hand-eye coordination. 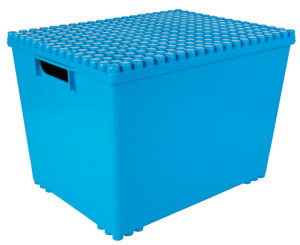 The versatile Multibox can be integrated into play. With Mega Construction Plate as lid. EXTRA: Play scenery „Farm“, pattern sheet and funny eye stickers. 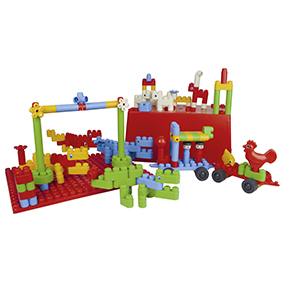 With 218 TWINI parts, toddlers learn to distinguish differnet colours and shapes in a playful way. 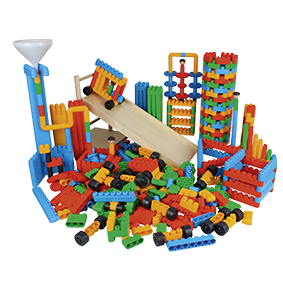 The large and easy to handle building bricks made for quick building successes and thus stimulate creative play. The versatile Multibox can be integrated into play. With Mega Construction Plate as lid. EXTRA: Play scenery „Farm“, pattern sheet and funny eye stickers. Big set - wide variety. 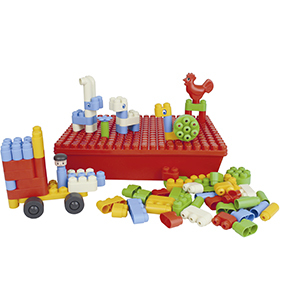 This set offers the perfect solution for social play in the kindergarten. The 92 BASIC pieces offer endless combination possibilities for imaginative figures and structures. 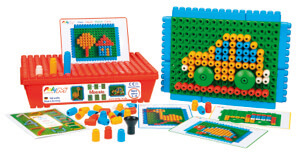 This promotes creativity and fine motor skills through play. Even the versatile Multibox can be integrated into play. With Mega Construction Plate as lid. EXTRA: Quick start guide STARTER and funny eye stickers. 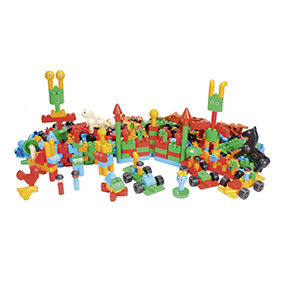 The 150 BASIC pieces offer endless combination possibilities for imaginative figures and structures. 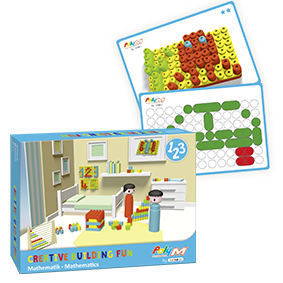 This promotes creativity and fine motor skills through play. Even the versatile Multibox can be integrated into play. With Mega Construction Plate as lid. EXTRA: Play scenery „Safari“, pattern sheet, quick start guide STARTER and funny eye stickers. 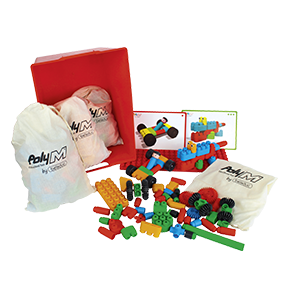 These articles can expand or be added to the existing sets as all Poly-M building bricks are compatible. 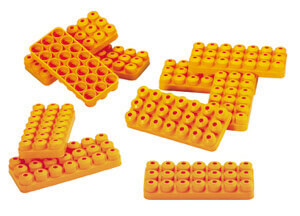 180 building bricks with 1-2-3 studs. 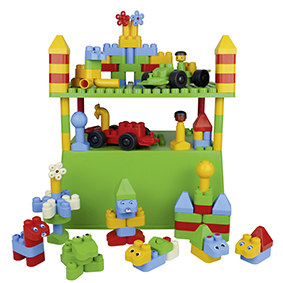 Ideal for free play in day nurseries and pre-schools or as a supplement to existing Poly-M equipment. EXTRA: Eye stickers. 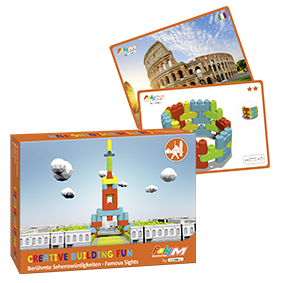 Vertical, horizontal, and circular construction - anything is possible with these 340 BASIC building bricks. 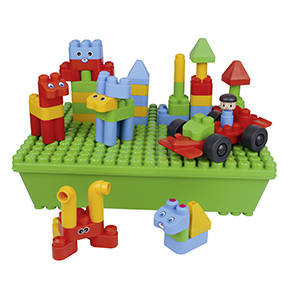 The different shapes of building bricks allow the children to let their imagination run free. The angular bricks even facilitate three-dimensional construction. The versatile Multibox can be integrated into play. With Mega Construction Plate as lid. EXTRA: Play scenery “Safari”, sticker card and Quick Start Guide BASIC. 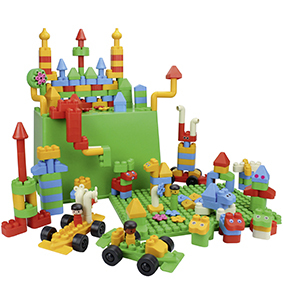 A fantastic building-brick set for every play corner. 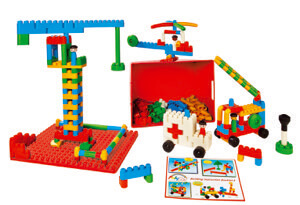 Large and small vehicles or movable structures can be built using the different wheel sets and BASIC building bricks. That way, children make their own experiences and develop creativity by building their own play world. Ideal for free play. EXTRA: Stickers and Quick Start Guides STARTER and BASIC. 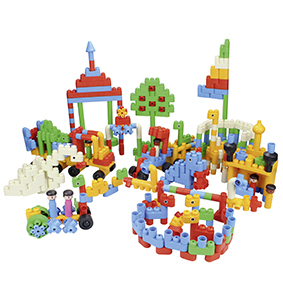 You can build higher and higher with these 1000 BASIC pieces. 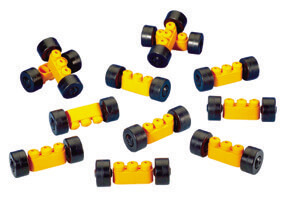 Enough pieces for a large group project or many individual building ideas. This encourages team work, creativity, and problem-solving strategies. The two large Multiboxes can be integrated into play. With Mega Construction Plate as lid. EXTRA: Sticker card and building instruction booklets STARTER and BASIC. 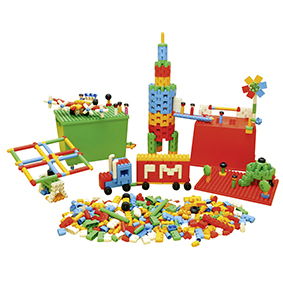 The perfect building-brick set for every play corner. 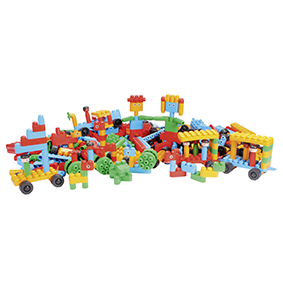 Large and small vehicles or movable structures can be built using the different wheel sets and building bricks. Are the children able to rebuild the buildings of the task cards? 4 children are experiencing the Poly-M building bricks under the supervision of a teacher. 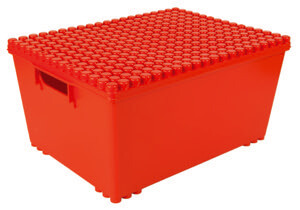 400 building bricks offer unlimited possibilities for children. With lots of BASIC and GEOBLOC building bricks providing children with first experiences in structural engineering and technology. 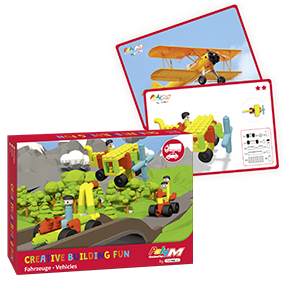 The three included building instruction booklets contain new ideas and stimulate own, creative developments. The people and animal figures help to bring it all to life. EXTRA: Sticker and Quick Start Guides STARTER, BASIC and GEOBLOC. 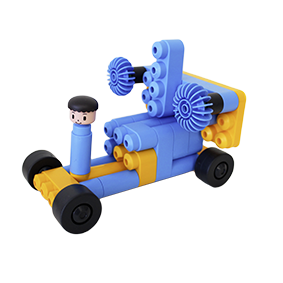 The gear wheels provide children with an ideal introduction to everyday basic principles of technology, e.g. gear wheels, levers, transmissions, wheels and axles. 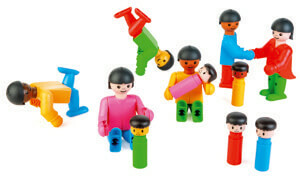 47 pieces to make up 6 movable people figures and 5 baby figures from different ethnic origins. The figures can be dressed and are ideal for dolls houses and multicultural role play. 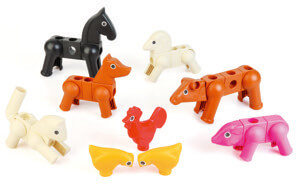 Consisting of various parts, all 9 Poly-M animals (with the exception of cockerel and hen) are movable, and can also be reassembled to create imaginary animals. EXTRA: Building instruction booklet ANIMALS and eye stickers. This is the best play fun ever! 831 BASIC and GeoBloc pieces, incl. people and animal figures as well as many great accessories, make this set attractive for boys and girls. 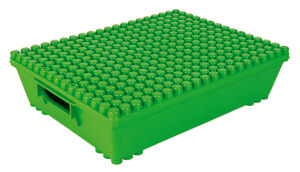 Perfect for a large group project or many individual building ideas. This encourages team work, creativity, and problem solving strategies. The two large Multiboxes can be integrated into play. With Mega Construction Plate as lid. 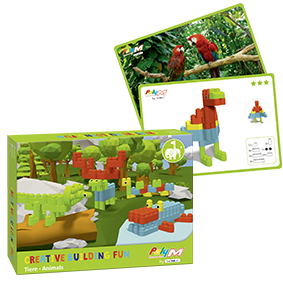 EXTRA: Sticker and instruction booklets BASIC, STARTER, GEOBLOC and ANIMALS. The Poly-M meadow of flowers is a charming challenge and chance to practice fine motor skills and hand-eye coordination. The 50 little sticks and 50 flowers come in 6 assorted colors and can be stuck on the 4 green “meadow” universal plates in whatever combination of colors you like. Recommended: up from 3 years - without small parts. 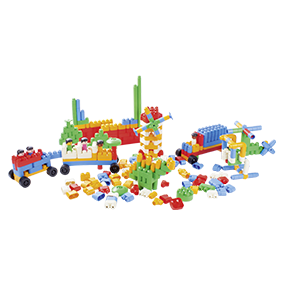 A set of 125 pieces including different building bricks and 6 universal plates - to make up imaginative, three dimensional patterns such as houses, vehicles, figures. The versatile Multibox can be integrated into play. 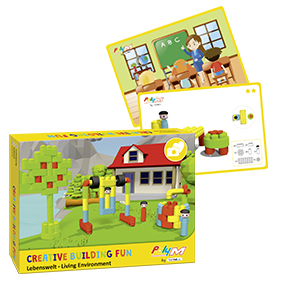 EXTRA: 4 Creativity cards with 8 models, idea booklet MOSAIC, eye stickers and a useful pulling device. Water experiments, gear wheels and cars with a ramp? Experiments encourage the children to have own questions on the material. Elephant, frill-necked lizard or horse. Experience the variety of the animal world. Fire engine or racing car? Try to build various vehicles. 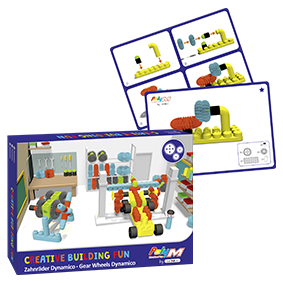 Discover the versatility of gear wheels and build a wide variety of machines. Brandenburger Gate, Taj Mahal or the Big Ben? 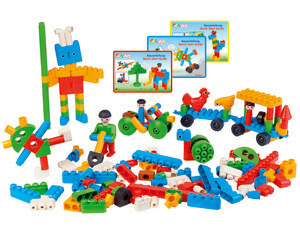 Find out which creations are possible to build with the bricks. Numbers, lengths, shapes. Experience the world of mathematics. Basket or photo camera- discover great everyday objects for a roleplay. 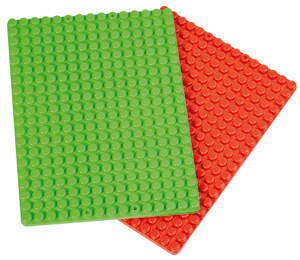 Discover the endless possibilities of the Poly-M building bricks. 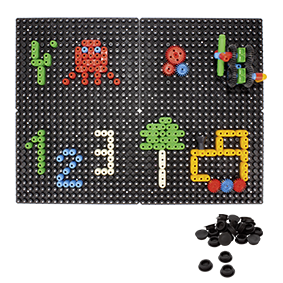 With the help of this block that contains 16 pieces you can create various creations. 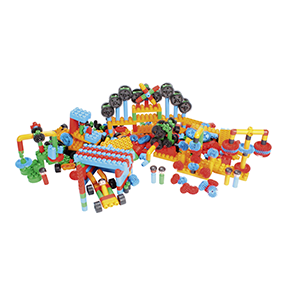 The fantasy car shows many different possibilities of how to use the Poly-M building bricks. Out of a simple car with 32 building bricks various small objects can be created. Sensing, turning, wondering…After the Mega Construction Plates are fixed to the walls the children can be creative with the gear wheels, big, small, long and short building bricks.